Fireplaces are welcoming, soothing and romantic. Sitting fireside is a great spot to experience a hot cup of coffee, relax, study a book or cuddle with your loved one on a cold night. Not only are fireplaces perfect for a relaxing night, but they also help you save on home heating costs. However, as with any heating appliance, ideal preservation is necessary for making sure your home is not at risk for fires and to prolong your fireplace’s life. You can do this by getting your fireplace chimney cleaned every year. Even if your fireplace has been acting normal, it’s important to make sure your fireplace chimney is cleaned annually, to ensure that it continues to function effectively and safely. Your fireplace chimney is very easy to forget about since you don’t see it every day. You also cannot see how dirty it is, or spot a creosote buildup. Understanding how to clean your fireplace chimney is essential to the security of those in your home, particularly if you use your fireplace on a daily basis. Chimney cleaning and preservation is vital. Over time, with the ongoing use of your fireplace, creosote and soot can build up in your chimney. These creosote and soot build ups are very flammable and can cause a damaging house fire. Other dangers consist of removing any debris, birds’ nests, etc., that may additionally have also accumulated in your flue. Whether it’s creosote, soot or a different type of debris in your chimney, any of these particles can cause a problem, as they can obstruct the release of smoke from your fireplace. These obstacles could cause a fire hazard, a buildup of carbon monoxide, or excessive smoke stages in your home. It’s very important to get your fireplace chimney cleaned once a year to save your fireplace chimney from such hazards. A fireplace is an ideal spot to relax and admire the heat from the flames, but it can pose a safety threat as well. When wood burns, it produces byproducts such as hydrocarbons, smoke, and soot that are sent into the fireplace chimney. As these contaminants head upwards in the chimney, they mix with moisture, condense, and cause an exceptionally flammable substance known as creosote, a thick oily chemical. If the cleaning of a fireplace chimney is put off for too long, the creosote chemical can accumulate to unsafe levels. Sparks from the fire can come into contact with the creosote buildup and ignite, thus causing a chimney fire. This is one of the most important reasons why you should get your fireplace chimney cleaned annually. Scheduling an expert fireplace chimney sweep often to inspect your chimney for any creosote or debris can not only protect your chimney from damage but also protect your home from a fire. If your chimney is not properly maintained, it won’t function as efficiently as it could. It’s important to make sure there is no debris obstructing the airflow in the chimney. Wood with excessive moisture content creates excess smoke and steam in the firebox, making it very important to have proper air flow. Animal nests, twigs, leaves, and different particles can cause an obstruction for your chimney, lowering indoor air quality and exposing occupants to carbon monoxide. The fireplace chimney cleaning specialist will inspect, clean, and safely clear out any debris caused by animal activity or bad weather. 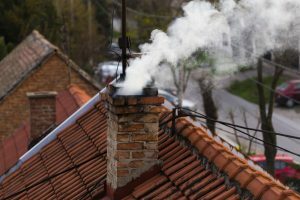 Installing a chimney cap can assist with blocking particles and excessive moisture from getting into the flue, but this will need to be cleared every year a well. Maintaining and caring for your fireplace chimney extends the life of your fireplace, stove, chimney and can potentially save your home. Although chimneys are constructed to withstand destructive factors, they do deteriorate if they are not properly cleaned. Also, immoderate moisture, strong winds, and hail can cause structural injury to the masonry that speeds up its deterioration. Various troubles with the flue liner, chimney cap, vents, leaks, and other issues can develop into additional issues, which can be costly to repair. If you want to protect your house and your fireplace chimney from any hazards, you can get help from us. We have reliable professionals who will conduct a proper chimney sweep and inspection that will make your house completely safe from any hazards. So, fill out the form below to get in contact with experts who will perform a reliable fireplace chimney inspection and cleaning.